Dear friends who have dedicated yourselves in education, nice to meet you all tonight. I am going to share my opinion on an issue related to education today: whether education can change one’s fate; whether education can increase social mobility. This is a hot topic and I have some opinions that may be different from yours. My answer is: yes, education can fostersocial mobility and change the destiny during the era I lived in or before the 90s. There is no future ahead of us if we do not study. If we are university graduates, we must be able to become a member of the middle-class or even the upper-class. Nevertheless, this is completely different nowadays. Basically, the state of education itself cannot change your destiny. There are many other factors such as personal factors and those related to the nature and environment which may vary whether education can change one’s fate. So why education was deemed to be a dependable agent to change our fate but it seems that it has lost its magic today? I believe there are internal factors and external factors. Let’s start with the internal factors. The current education system is different from the one in the 70s and the 80s. There was a crucial factor in the past education system: even if you have no money, you can still receive the best secondary education, i.e. basic education. When I was young, I was really poor. Yet, I could still attend a good secondary school with my good school results. I didn’t even have to pay for the tuition fee. What’s more, I was offered living allowances. In other words, the characteristic of the education system in the past was that nobody would be prevented from getting the best of secondary education because of the lack of means. On the contrary, if you have no money nowadays, you will never receive basic education in good quality. Like what the chairperson said, you are far left behind byothers at the starting point. To put it in another way, those who are more capable and well-off have the advantages right at the starting point. Compared to the old days, we, the post 70s, can receive the best secondary education regardless of our socio-economicbackground. 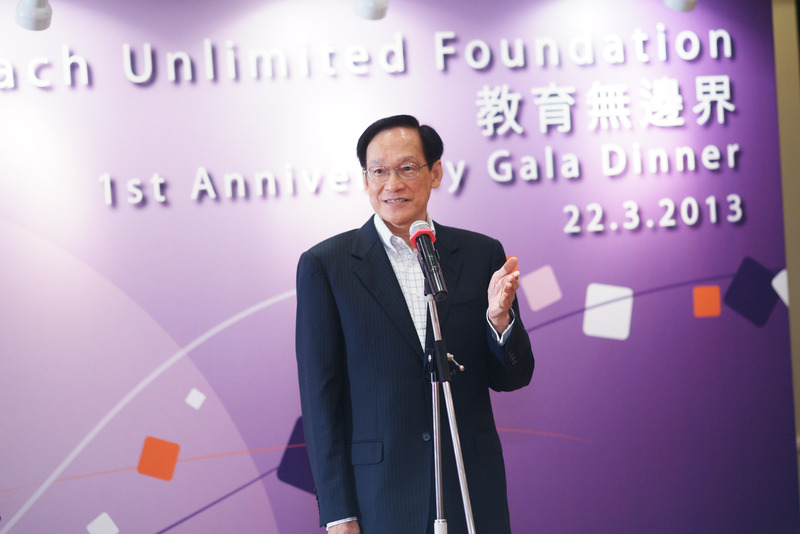 At the moment, the tuition fee of Direct Subsidy Scheme (DSS) Schools is about HK$70,000 a year. International schools, HK$10,000 per month. An ordinary family can never afford the best education nowadays evenif you pass the exams with flying colours. However, there’s still a point, what is the difference between today’s university education and the one during my generation? During my era, if you did not have money, you were not able to attend university. In Hong Kong, only the student with the best results among 20 students could attend university without paying any fees. Other students were totally born with a rich family background. Certainly, in my era, only around 500 students were university graduates and those university graduates were “god’s favored one”. But how about today’s era? I can proudly tell the whole world thatin Hong Kong, no one will be rejected by a university due to the lack of money. It’s true. It is what we are proud of. But italso makes me worry.Universities expand too fast today.In Hong Kong nowadays, almost 60-70% of young adults are studying various university courses in different kinds of programs, but only 18% of them can successfully attend the UGC (University Grants Committee)-funded programs. The problem is that the other 40-50% of studentsare receiving a kind of university education which we do not know about its quality, control, and management system. Some people said it’s good enough to receiveuniversity education. However,to an economist, we are forcing those young adults who are not yet well prepared to receive university education. Moreover, they need to make loans to do so.Even if they graduate, they still cannot find a job easily. When they can finally find a job, they have to spend a large portion of their salary to pay back the government.Even though these are self-financed courses, the government still needs to support Associate Degrees and Self-funded Top-up courses. If your academic results are not up to standard, choosing a top-up degree may make you graduate faster than those who can successfully enter into a university. I am not sure if it can guarantee you a master degree after 3 years but you can definitely not graduate from other university in 3 years. What surprised me is that, one day, an education committee told me that there were 20 different kinds of institutions providing associate degree courses, or some certificate courses that had connections with other countries.I am not sure if others will think that our competition is too fierce. But the reality is that all of these are definitely commercial products. Today’s higher education has already come to a flood stage. Compared to our elite system era, it is totally different. Therefore, this interior factor makes us feel that even though you are a university graduate, education cannot change your fate. The reasons are that your secondary school education is not the bestand you are forced to complete your university degree. Or, even if your university education is of good quality but your secondary education is not. However, more important are the external factors. The whole world has been changed. Over the past 20 years, we namethis kind of economy as New Economy. The “N” and “E” in “NewEconomy” are written in capital letters, which means “NewEconomy” has a special meaning, and it is not just simply referring to a new economy. The characteristic of “New Economy” is ICT. Information, Communication and Technology are predominant. Under ICT, the first phenomenon that occurs is digitizationwhich means everything is digitalized. The result of digitization is that the small scale economy will be as efficient as the large scale economy. Previously it was the Ford model. Every year they had to make over several hundred thousand cars in order to reduce the production cost and to beat the competitors. But nowadays, with micronized computers and digitization, you just need to pay 5% extra above the price to specify all the fittings, colors, andother equipment when you order a car.In other words, today’s economy is no longer named as economy of scale, the concept is economy of scope. That means all the other different layers can be covered, but also in a very low cost. Today’s model is a GE Model. Previously, it was the Ford model which produced Ford cars and belonged to economy of scale. Today’s model is the General Electric Model which does not produce washing machines or hair dryers. Today’s GE is Technology, Finance, Insurance, Environment, etc. Thus, a single company can complete all sorts of tasks with high efficiency. Digitization results in globalization. Since ICT is so advanced that the whole world can get in touch with it, globalization becomes widespread. Globalization also produces Concentration of Capital. Since a lot of wealthy people purchase and merge as a result of globalization and in addition to emergence of many financial innovations, the world runs Concentration of Capital once again. On the other hand, Concentration of Capital also results in something we called Digital Divide. We can use 3 words to describe the new economic situation: Digitization, Globalization, and Concentration of Capital. What is the result? The result is that both education and textbooks become useless. Perhaps it is useful for some Lingnan University students but I always heard that textbooks were not useful while I was having breakfast. Why? It is because even if you study, the knowledge becomes outdated tomorrow. We cannot remember so much with our brain. In the old days, becoming the best student is surely excellent. However, nowadays, a memory stick is equivalent to a million or even a billion brains. Then why do we need to remember? We don’t need to remember so many things and even if we don’t know something, we can enter a word into a search engine which will give us endless results. Then for what do we study? Studying is outdated, right? Therefore, in the past, education can change one’s future. Everyone tried their best to study. Nowadays, if you acquire some knowledge and tomorrow you let someone enter a word into a search engine, that person becomes smarter than you. This is the theory that studying is no longer useful. Excuse me for saying this, everyone. What do we really need today? Since the contents we learned from textbooks are time-bound which means it is limited by time and space and while these things will have already been changed tomorrow, what we need to find out is how we can mobile upwards and how we can change our future. What we need to acquire should be non-time-bound which is not limited by time and space. If we have better non-time-bound skills than others, then we can stand out among our fellows. And these non-time-bound skills, sorry that I need to make a short advertisement here, are implemented in Lingnan University. The skills require ABC plus 3Cs. The non-time-bound skills that now we need are ABC, which can be remembered easily as: adaptability, brain power, and creativity. Nowadays, you can choose not to study completely and if you have high adaptability, brain power, and creativity, you are perfectly fine. The skills that we are talking about here are not technical professional skills. We are talking about 3Cs:cognitive skills which are problem-solving skills, communication skills and community skills which are skills that enable you to interact with people in the society. Therefore, ABC and 3Cs can allow you to be outstanding in this new economic environment. However, unfortunately, people cannot study ABC and 3Cs. If there were a book that told you about ABC and 3Cs, it would not be useful because these skills cannot be written down. ABC and 3Cs can only be nurtured starting from a young age. Therefore, why can’t today’s education change one’s future? It is because all these qualities need to be nurtured starting from a young age, like at the age of 3, in the kindergarten or even earlier.That’s why foundation education is more important than tertiary education. Therefore, the reason why we cannot change our future is that the starting line is different. Under this New Economy, we need something that is gradually nurtured since age 2 to 3. Therefore, pre-education is crucial. Whether you have a good pre-education and a good primary education determines your future. Today, whether one is a university graduate or not cannot determine one’s future. This is produced under New Economy. To put it simple, under New Economy, what is most important? The old times are outdated now. It is not how much education you receive. This is no longer important and you probably will not remember. The most important is how good and how soon you get the good education. It is good quality education and how soon you get it. The sooner, the more mobile upwards you are. If the government is still talking about 9-year free and compulsory education, 12-year free and compulsory education, and now 15-year free and compulsory education, they are barking up the wrong tree. It is not about how much education one gets but how good and how soon one gets a good education. It should be how good quality (of education) can be guaranteed. It is not that everyone can change his/her future as long as he/she gets education. Secondly, it is not what level of education you achieve. It is no longer important and it is not that university graduates must be better than secondary school graduates nor master graduates must be better than university graduates. It’s wrong! The most important factor is what type of education you receive, not the level of education you achieve. The “type” here is the type of education that you have been receiving from a young age. The traditional feeding type of education only requires you to study. This is no longer useful. The education you should receive from a young age is a liberal-minded education. Therefore, the 3-3-4 education reform that the government is implementing now is at least in the right direction because it is heading towards the direction that students should be liberal-minded with the addition subject of Liberal Studies. However, whether it is enough is not a problem of textbooks. The so-called liberal-minded education, which is an atypical education, focuses not on contents but the teaching and learning processes. Therefore, the importance of Teach Unlimited Foundation is that you provide two mentors in a school and students can have improvements through the unconventional teaching and learning processes given by these two mentors. Therefore, the processes are more important than the contents. We focus on the entire teaching and learning processes which is the most important part. Therefore, it is not the best to climb to the highest point and get a PhD degree. We need to consider the type of education. That is why when I hire people, my colleagues usually show me the highest qualification one got. I tell them never show me the highest qualification. The most important thing is to consider the basic qualification. Whether the basic qualification is good or not determines your foundation as well as all your non-time-bound skills under this New Economy. At last, I am talking about the solutions of education in Hong Kong. What can Hong Kong do? If we are facing a new situation but still need to adopt an outdated education system, I can only have 2 suggestions. The first one is that tertiary education must be consolidated and rationalized. More people can get education is a good thing but we cannot indulge too much. We cannot put the entire responsibility onto self-funded programs. I can only tell everyone that an average cost of a student from a UCG-funded program is around HK$200, 000 or ranged from HK$160,000 to HK$200,000. It will be around HK$500,000 for a medical student. In addition, government allocates the cost of assets and many other items for support. While a self-funded program only costs HK$40,000 to HK$50,000 and claims that its quality is the same as a UCG-funded program, do you believe in it? This is impossible. This amount of HK$40,000 to HK$50,000 also counts the interest from loans, etc. That was why when I was still a president, a group of presidents had a meeting with colleagues from the University Grants Committee. One of the presidents said, “Our self-funded programs are very good, exactly the same as our UCG-funded programs. We have kept a high quality and standard.” Before he finished, I kicked him under the table. I told him not to trick us and other institutions. If you are telling the government that a program that costs HK$40,000 to HK$50,000 can have the same quality as the one that costs HK$200,000, why does the government still subsidize us? Doesn’t she cut the subsidy immediately? Therefore, I had no choice but to kick him. Sometimes, we get too carried away by our success and keep saying that we have done a great job on our self-funded programs with quality guaranteed. However, it is impossible unless we have money. How can a HK$40,000 program compare with a HK$200,000 program? Therefore, I need to reorganize self-funded programs. The entire tertiary education needs an evaluation and consolidation. The simplest way is that the government bears the responsibility. Make 18%, a number which hasn’t changed for years because the responsibility has gone to self-funded programs, become 25%. Making UGC-funded programs become 25%. This is a solution. Spending like this is appropriate. Giving the responsibility to self-funded programs and encouraging private universities are not solutions. Our culture is different from American culture. In America, there can be a large variety of institutions, such as community colleges and universities of different qualities. However, the situation in Hong Kong is different. In America, the society is more flexible and students’ studies are more flexible, unlike Hong Kong. My second suggestion is that basic education, starting from early childhood education, should improve its overall quality. For example, we should adjust the salary of a teacher in early childhood education because how the society views their status is very important. In many countries, if one’s profession is in early childhood education, it does not mean that he/she is not as outstanding as others. He/She chooses early childhood education and it is his/her profession. He/She has the same salary as someone teaching at the university. Since their professions are not the same, recognition from the society is not the same. How can early childhood education be improved? Giving out pre-primary education vouchers is not a solution. It is not a problem about money and it is not that we give them money and they will have early childhood education. The thing we need to do is that we guarantee the best quality in early childhood education and primary education so that students will not be preventing from attending good-quality secondary schools since lack of money. How can this be done? Government can take her time and think about it. Going back to our era, if you had the ability and good examination results, you would not be prevented from receiving the best basic education since lack of money. Nowadays, it is totally the opposite. You can attend university but you cannot attend a secondary school with the best quality. Unprepared secondary school students are forced to attend university. After they graduate, they cannot find a job and will become depressed. They can only do demonstrations on the streets and yell. This situation makes our society unstable and imposes a problem on social stability. Then, how can we improve early childhood education, primary education, and secondary education in a short time? It is difficult. Surely, I can think of a method immediately for allocating resources and improving secondary schools, elite schools. Why doesn’t the government get 30% of the student places in those schools? The government can support students who have good results to study there. The situation nowadays is that some people’s children are smart enough to get into elite schools but they do not dare to study there because they think that their children will suffer when they see others go traveling to the U.S. with business class air tickets while they can only afford going to Macau. Under such comparisons, some families told me that they were not willing to send their children to elite schools. The only way out is to make everyone equal in elite schools. If the government gets 30% of the student places, 30% of students in elite schools may not have a privileged family background but still they can study there because of their high ability. Therefore, in the long term, there is a problem in the school system because the education system in Hong Kong needs to make a big move under New Economy. However, in the short or medium term, Teach Unlimited Foundation is doing a great job. I appreciate your work very much. I hope that you will continue to strive and make use of your unlimited boundaries. Give more opportunities to youngsters to foster improvements and progresses through teaching and learning processes.